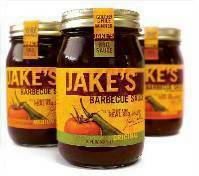 One of the age old secrets to good barbecuing is knowing when and how much barbecue sauce to use. Too much barbecue sauce and your meat is literally swimming in sauce which overtly covers up the flavor of the meat letting you only taste the sauce. Too little Barbeque sauce and all you taste is the meat without any added seasoning or flavoring to enhance your hard work. Jake's recommends you follow our easy to use chart below. Note, the amounts described below are suggested for preparing the meat in advance of cooking. Following cooking you can choose to add more sauce or dry seasonings as a condiment.